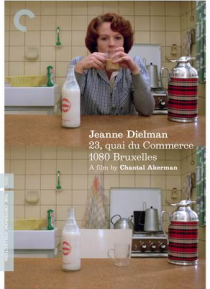 A singular work in film history, Chantal Akerman's Jeanne Dielman, 23, quai du Commerce, 1080 Bruxelles meticulously details, with a sense of impending doom, the daily routine of a middle-aged widow, whose chores include making the beds, cooking dinner for her son, and turning the occasional trick. In its enormous spareness, Akerman's film seems simple, but it encompasses an entire world. Whether … seen as an exacting character study or as one of cinema's most hypnotic and complete depictions of space and time, Jeanne Dielman is an astonishing, compelling movie experiment, one that has been analyzed and argued over for decades.